The following recipe is truly restaurant worthy, and it just so happens that is suitable for Sunday brunch just as it is for a weekday dinner. One sample spoonful from the pot, and it will be love at first bite, guaranteed. We’ve made a spring-fresh asparagus soup before, with the addition of potatoes and leeks, but here and now we are focusing on the salad to bring unexpected elements to the bowl. We suggest romaine lettuce, though in reality, you are free to mix it up as you wish and choose from whatever greens are fresh and in season. Arugula, commonly called rocket, will add a peppery flavor to any salad; while butter lettuce enriches the plate with large cupped leaves, complementing the distinctive taste of asparagus. Curly endive will certainly add an element of art to the salad plate along with its characteristic crunchy bitterness. And mâche, also known as lamb’s lettuce, will bring a hint of softness to the salad. Be creative and add dandelion greens, or lesser known leafy greens, for bonus nutrients in your meal. Young, tender asparagus is a spring harvested crop, so make sure you are ready with a bunch of recipes for when it is in season! Asparagus and tomato with gremolata makes for a wonderful side dish or appetizer next to any Paleo protein, while roasted asparagus with salt and pepper is as simple as it gets. Asparagus soup though, that is truly the way to go. Cut asparagus stalks into 1-inch pieces. In a large heavy pot over medium-low heat, melt 2 tablespoons of cooking fat. Add onions and cook until translucent and soft. Add asparagus and cook for five minutes, stirring constantly. Slowly add the broth to the mixture and season to taste with salt and pepper. Allow mixture to simmer, cover, and cook until asparagus is tender, approximately 15 minutes. Remove soup from heat and blend until smooth. Return soup to low heat. Whisk in coconut milk and remaining cooking fat. For caesar salad: Preheat oven to 375 F.
Slice the stem end of the whole garlic head off so that clove tips are exposed. Drizzle with 1 tablespoon olive oil, wrap in foil, and cook in the oven for approximately 40 minutes or until garlic is very tender. Once cooked, allow to cool. Pop out the roasted garlic cloves from their skins. In a food processor, combine roasted garlic, raw garlic cloves, and capers. Pulse until very finely chopped. Add the mustard and lemon juice to the processor and continue to mix. Slowly add olive oil and mayonnaise. 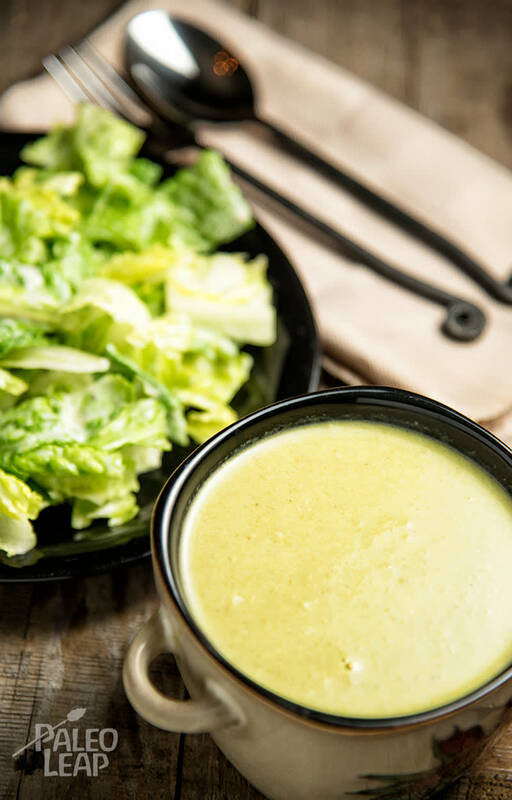 Drizzle the dressing over the romaine lettuce.